Reef Daytripper - Tourism Town - The Tourism Marketplace - Find and book authentic experiences. Experience The Great Barrier Reef from Cairns the way nature intended. No other operator in this category can offer you this superb personalised service. The personalised service and small passenger numbers (max 20) makes you feel like you are aboard your own privately owned yacht! Enjoy the open ocean in this romantic atmosphere on your excursion to Upolu Reef on the Great Barrier Reef! Our destination, Upolu Reef, is a very beautiful location situated on the edge of the Outer Barrier Reef, and is teeming with a large variety of interesting marine life and a beautiful array of corals. In the sheltered lagoon you will see a multitude of; giant clams, turtles, sea stars and reef fish. This offers a perfect snorkelling or diving experience in warm clear protected waters. A complementary snorkel guide is available, which offers a fun and informative addition to the day’s exploration. 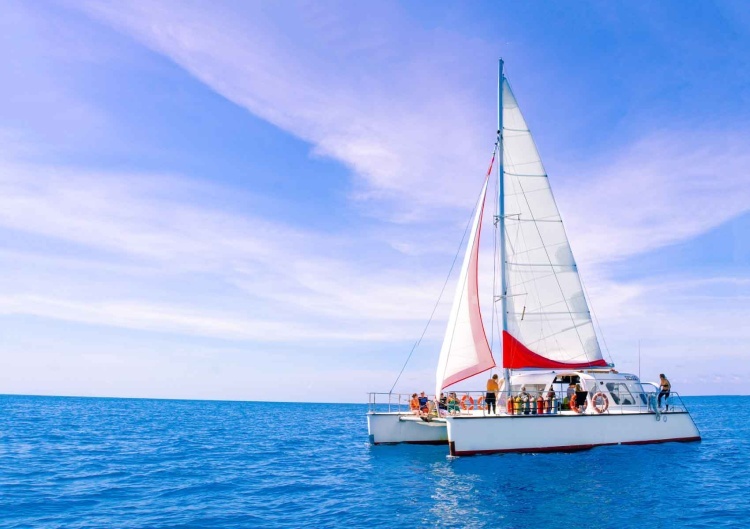 Enjoy the open ocean in this romantic atmosphere on your excursion to Upolu Reef on The Great Barrier Reef. All snorkelling equipment & safety tuition. Reef education & guided tours. Scuba skills update (certified divers). Complimentary wine cheese & fruit platter. You choose freely between snorkelling, diving, or just relaxing on our bownets. We also offer introductory diving. Perhaps you also like to look out for dolphins, turtles or even whales (seasonal). Payment is not required at this stage. Reef Daytripper will contact you directly to confirm payment options and availability.